I was doing an exam on a patient recently. The patient had quite a few silver fillings that were probably 20 years old or older. I had some concerns for some of the teeth. Not because of the age of the fillings. 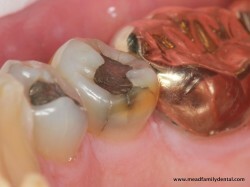 Fillings like these can often last 20 years or more. It was because of the fracture lines I could see. This tooth exhibits several stained and diagonal cracks. The tooth had no pain. I put took a photo with a digital camera and it popped up on the screen of the iPad after a couple of seconds. I zoomed in the cracks. The patient gave me an exasperated look. An "internal" fracture that was underneath a filling. This tooth had pain on biting. I know, I know. That is a very cheesy line. I use it all the time because it’s so true. A tooth with this kind of crack, particularly a stained or diagonal fracture is at great risk of breaking. The very best thing we can do for it is to cover it with a crown or onlay. As soon as possible! 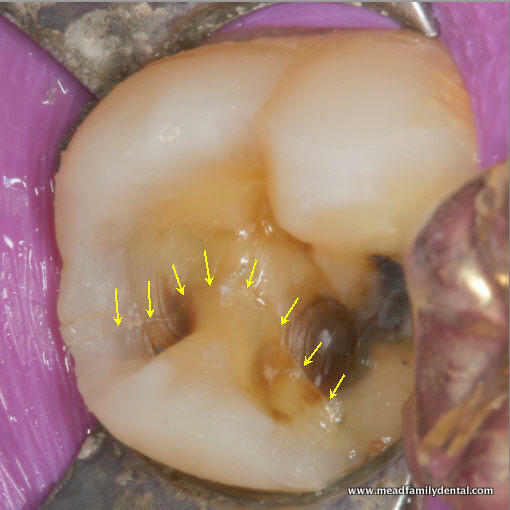 In many cases there are internal fractures underneath fillings that have been in place for a long time. Sometimes we don’t see those until we remove the existing filling. These internal cracks are much more likely to be sensitive on biting. Sensitivity to biting is another symptom that shouldn’t be ignored and should be treated right away! The moral of this story is…don’t wait! A tooth is less likely to have complications (like needing a root canal) if it’s treated as soon as problems are diagnosed. This dentist REALLY prefers no complications! Did you find this post awesome? Bogus? Excruciating? I’d love to hear about it! You can share any Mead Family Dental post with a “Like” on Facebook, a “+1″ on Google+ or you can even “Tweet” it with Twitter! All you need to do is hover over the heart shaped button next to the title of the post. Or you can leave a comment by clicking on the balloon shaped icon next to the title.